No one likes when there is a spill on their carpet, but with the help of our technicians, it can be cleaned before becoming a permanent part of the carpet. Spot Removal is a critical step in our cleaning process. Some spots can be simple or tedious to remove from the carpet depending upon the spot and how long it has been on the carpet. 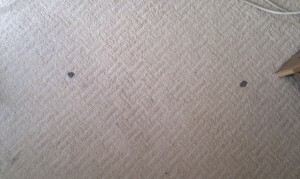 At times multiple applications of the spot removal solution, or a second is required to clean the spot from the carpet. A spot usually result from a foreign substance or material in a relatively small area such as mud, oil or food that has adhered to the outside of the carpet fiber. Spots like paint, oil, grease, gum or dairy such as milk, creamer, baby formula; eggs, fish, blood and body fluids are treated by using specialize technique to break down the chemistry in the carpet fiber without causing any dye loss to the carpet. When you attempt to remove the spot with some household products or over the counter bleaches, you may affect the color or texture of the carpet. In order to avoid permanent damage to your carpet, call your carpet cleaning tech to assist you in removing this spot without damaging your carpet. After we use the right chemical to remove the spot from your carpet, we make sure to thoroughly rinse or extract the area to avoid re-soiling.